Our new class 103.1 is more elaborate and richer in details. The typical TEE and IC locomotive. The entire locomotive is constructed chiefly of metal. 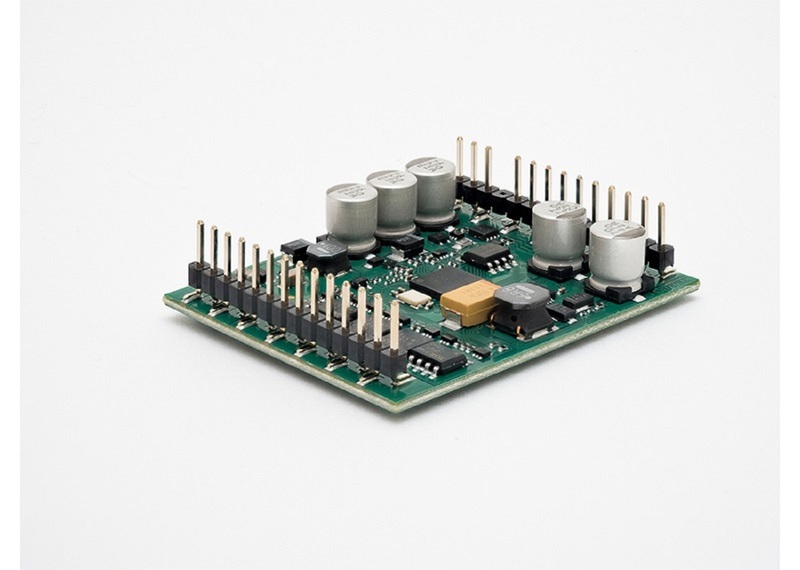 Newly developed decoder generation with a current buffer and 32 functions. Scale advanced model with improved super detailing. Powerful all-wheel propulsion by means of a centrally mounted motor and cardan shafts. Pantograph mechanisms on both ends that can be controlled in digital operation. Digitally controlled Telex couplers at both ends that can be replaced by prototype couplers included with the locomotive. Headlights / marker lights and interior lights with white and red LEDs. Model: In many details, this is a redesigned model. The locomotive's frame and the side frames on the trucks are constructed of metal. The body is prototypically divided into parts and is constructed chiefly of metal. The locomotive has a newly developed mfx digital decoder with 32 functions, fine motor control, and a current buffer. The locomotive can be operated with AC power, DC power, and Märklin Digital. The locomotive has a powerful motor, centrally mounted. All of the axles in both trucks are powered through cardan shafts. Digitally controlled Telex couplers are mounted on both ends. They can be replaced by prototype couplers included with the locomotive. The double-arm pantographs can be raised and lowered with servomotors in digital operation. The white headlights and red marker lights are LEDs. They will work in conventional operation and can be controlled digitally. The locomotive has white LEDs to light up the engineer's cab at the front of the locomotive (depending on the direction of travel) and the engine room. The engineer's cab doors can be opened, the locomotive has interior details, and there is a figure of an engineer in cab 1. The grab irons are metal and there are many other separately applied details: windshield wipers, antenna, whistle, headlight bezels, and much more. 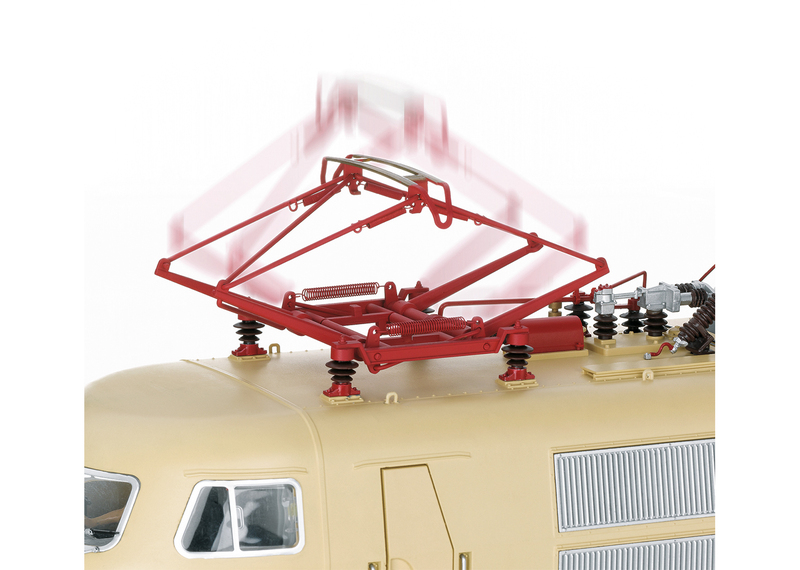 The roof equipment is detailed with double-arm pantographs. The side frames on the trucks have been improved with many other separately applied details such as sand pipes and lines. The buffer beams have sprung buffers and separately applied brake lines. The Märklin couplers can be replaced by closed end skirting and prototype couplers. The locomotive has many sound functions such as multi-stop announcements, various dialogs including announcements. The minimum radius for operation 1,020 mm / 40-3/8". Length over the buffers 60.9 cm / 24". The Class 103 - the DB's Media Star! The German Federal Railroad ushered in a new era, when the class E 03 was presented in 1965 at the International Transportation Exhibition in Munich: regularly scheduled passenger service at 200 km/h / 125 mph. In addition, the class E 03, designated as the class 103 in the German Federal Railroad's roster from 1968 on, represented a milestone in locomotive development - it was the first express locomotive to surpass the class E 19, whose design dated back to the Thirties. Reason enough to be proud of this powerful, beautifully shaped locomotive and to put it accordingly in the limelight. Hardly any other locomotive like the class 103, known for an entire generation as the Intercity locomotive, was marketed so much in the media. In TV ad spots, posters, and brochures this locomotive became a symbol for the German Federal Railroad's dynamism, a guarantee for reliability, speed, and comfort. Extensive test runs, among them regular speeds of 200 km/h / 125 mph between Munich and Augsburg, were done with four prototypes, until the class 103 was purchased as a regular production unit starting in 1970. The 145 locomotives differed from the prototypes in leaving off the decorative striping and in double rows of vents. Single-arm pantographs were installed on the locomotives from 1976 on, and the last series of units delivered had longer engineer's cabs, because crews complained about the cramped workspace. The aerodynamic, six-axle locomotive had a total continuous power rating of 7,440 kilowatts / 9,977 horsepower and was the most powerful DB locomotive until the use of three-phase current technology. The high startup tractive effort as well as the electric brakes, independent for the first time of the catenary and connected in series with air brakes, drew favorable comment worldwide. The performance strengths of the 103 were reflected in the enormous number of runs and even today, it is still rated as the locomotive with the highest level of service life in Germany. Its uncommonly attractive looks remained essentially unchanged during its use on the DB. In later years, the skirting and the buffer cladding were removed and several locomotives were painted in the "Orient Red" color scheme; only one unit was painted in "Traffic Red". The German Federal Railroad's class 103 was very popular with crews and passengers right up to the end of its regularly scheduled use, and it is understandable that a considerable number of them have remained preserved as museum locomotives. Many people today remember back as if it were just yesterday when they were young and how the 103 flew past them on the station platform. 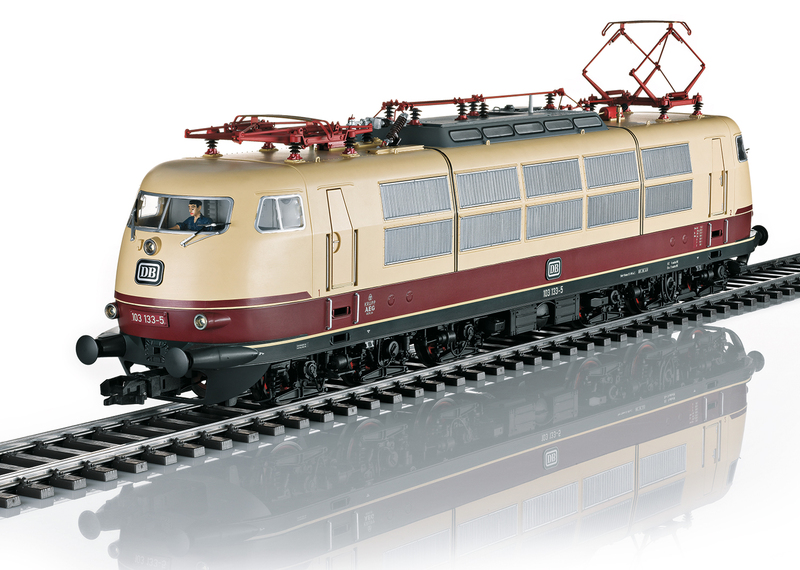 Since the prototype's introduction into service, it was a special challenge and joy for the Märklin Company to develop and offer an appropriate model to our customers. We are therefore proud in 2018 to produce a model of the top class in 1 Gauge exclusively for our loyal Insider customers. 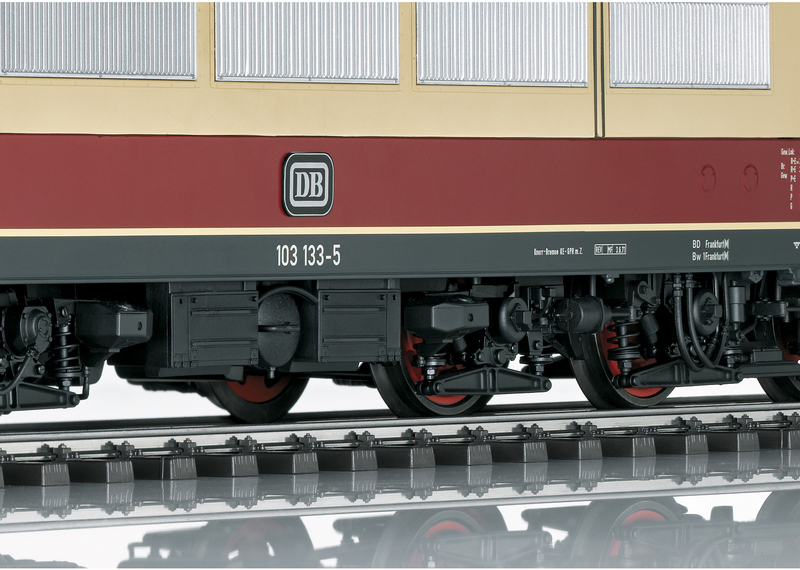 The realization of this model is being done in the customary uncompromising construction and as it once was a star in the prototype, this model of the class 103 will be a star in your 1 Gauge collection.